1. Preheat the oven to 200ºC, gas mark 6. Heat the oil in a large frying pan and fry the sausages for 3–4 minutes until browned. Reduce the heat, add the onion and fry for 4–5 minutes. 2. Meanwhile, place the mushrooms on a baking tray and bake for 10 minutes. Add the marmalade and vinegar to the sausages and cook for 2–3 minutes until cooked. 3. Cook the potatoes in boiling water for 10–15 minutes until tender, adding the beans for the last 5 minutes, then drain. 4. 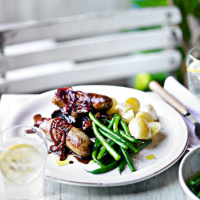 Serve the sausages on top of the mushrooms and drizzle over any remaining sauce. Serve with the potatoes and beans.